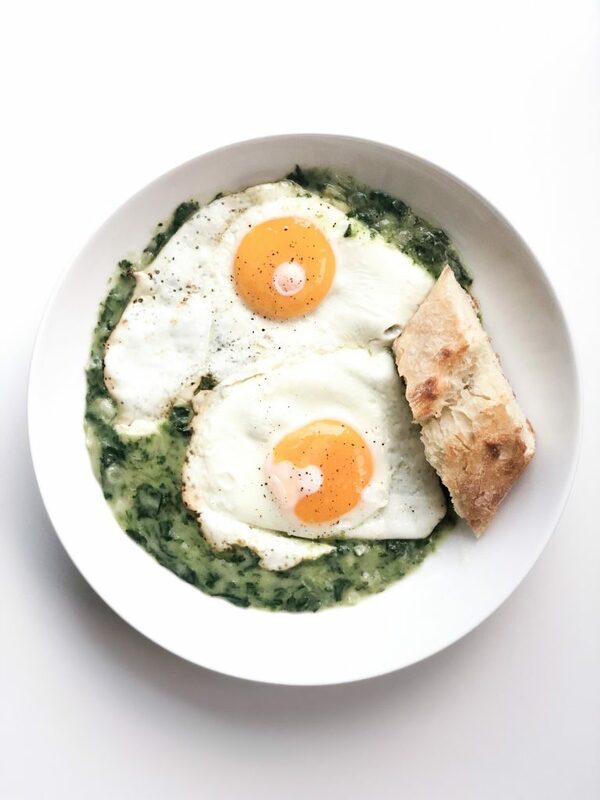 Me and this Creamed Spinach with Eggs dish, go way back to my childhood in Romania. 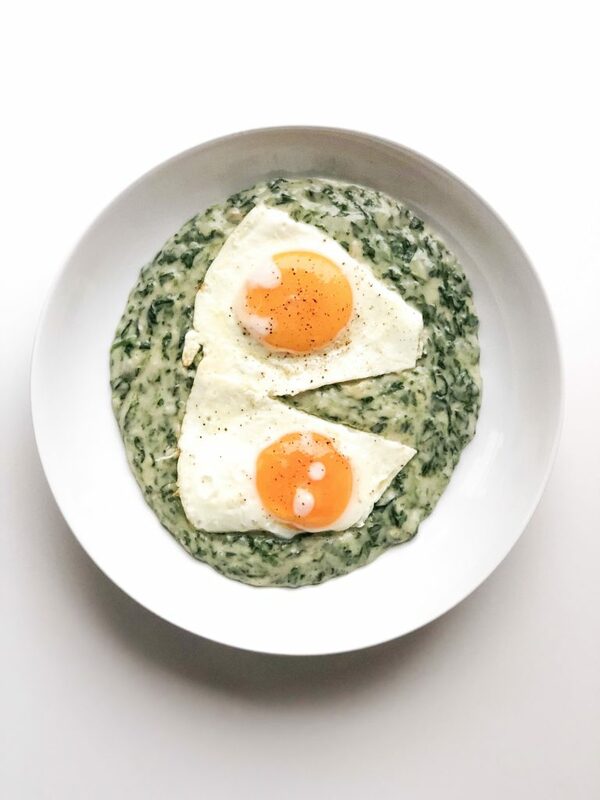 My mother made this Creamed Spinach with Eggs dish often and I imagine it was due to the fact that this is a very inexpensive meal to make and that it’s quick to get on the table for a family of five. It’s also very delicious and filling. All you need is some essential kitchen ingredients and cooked greens. I used spinach here, but you can substitute with whatever cooked greens you wish. 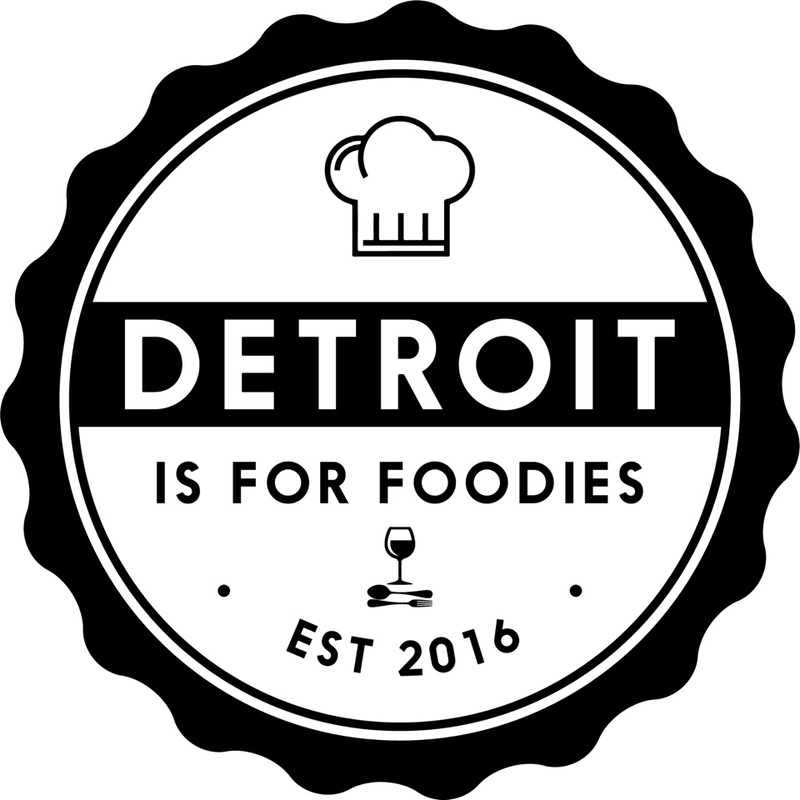 Like: Swiss chard, dandelion greens, etc. I like to serve it with a nice slice of crusty bread; preferably warm crusty bread. Also, my husband eats his with a good sprinkle of hot sauce. Cholula is his go to. This is a weekly meal for us and we don’t seem to get sick of it. So yummy! And, when I say that we lick the plate clean, I am not kidding! Well, we don’t exactly licking it but, we do wipe it clean with that crusty bread. And if you don’t believe that I make this all the time, these various photos are proof! Most of the time, I pick up a giant container of fresh Spinach from Costco and cook it. 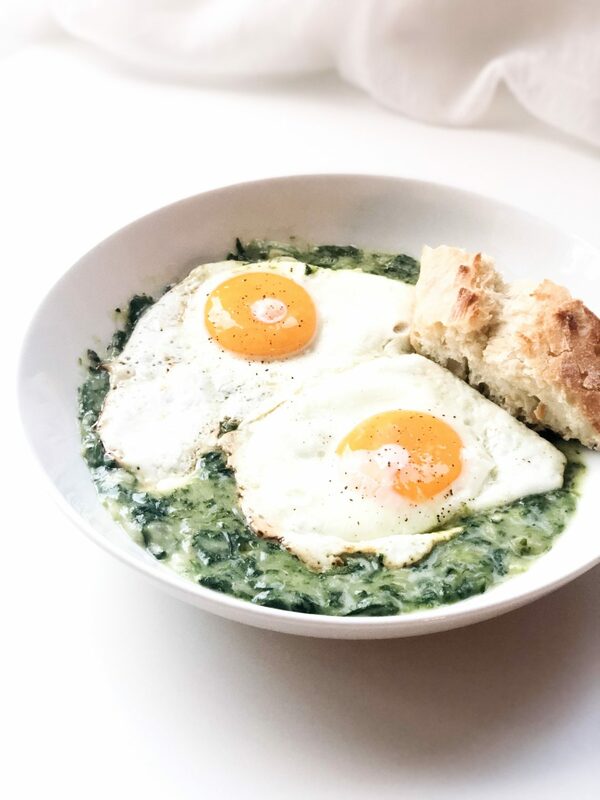 I use half of it to make a fresh batch of Creamed Spinach with Eggs, and I freeze the other half for another quick batch in the future. All you have to do is boil the Spinach in salted water for 3-4 minutes, let it drain, then place it in a freezer bag and into the freezer. When you are ready to use it, take it out of the freezer and let it thaw at room temperature for a couple of hours. It could be microwaved for 2-3 minutes as well. So give this favorite of mine a try and let me know how you like it. 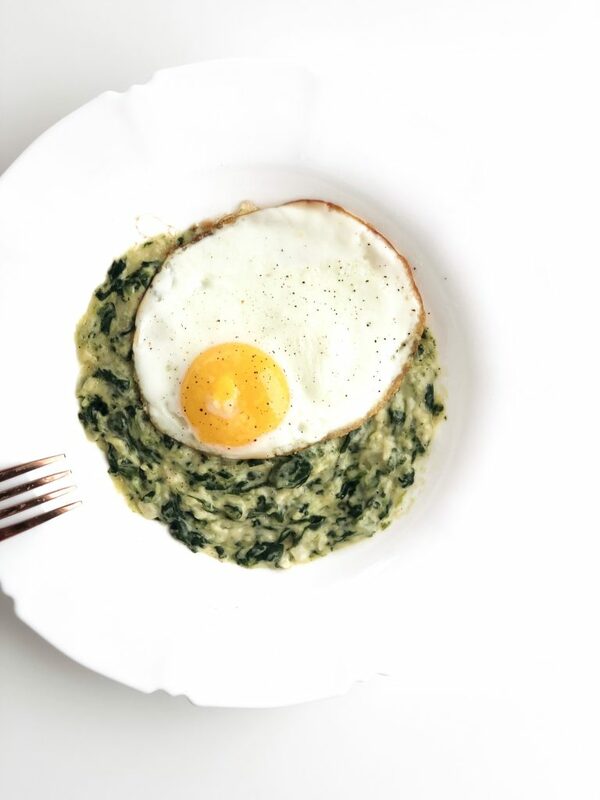 Make Popeye proud, because Spinach does make you stronger!!! Enjoy. Easy to make, budget friendly, comfort meal. If you are using fresh Spinach, add it to boiling water and cook for 3-5 minutes. Drain. If you are using frozen Spinach, make sure it's thawed and drained. Heat a medium sized sautee pan on medium heat. Add the butter and the oil to the warm pan. Next, add the chopped onions and red pepper flakes and cook for 3-4 minutes. Add the minced garlic. Mix in and cook for 1 minute. Sprinkle the flour over the mixture and allow to toast for about a minute. Whisk in the half and half, the broth and sour cream. Continue whisking until the mixture is smooth. Add the spinach and mix well. Remove from heat and allow to rest and cool for 5-10 minutes before serving. Cook the eggs while you wait. Enjoy with a slice of crusty bread!